What an attractively dressed beauty this tropical butterfly is! 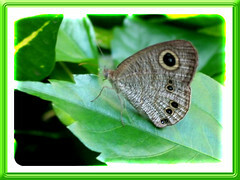 With wing span measuring 3-4cm, this Common Five-ring butterfly is greyish brown on the upperside with a large sub-apical ocellus on the forewings. 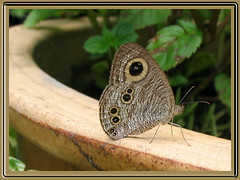 On the reverse side of its pale buff brown undersurfaces with fine dark striations, you can spot a large yellow-ringed black ocellus on each of the forewings. And, on the underside of each hindwing will prominently feature five smaller rings (eyespots), with the pair of rings at the tornus counted as one. 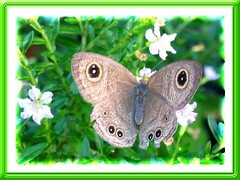 It is this total number of rings counted that give this butterfly its common name. It has a feeble flight and usually found close to the ground. The distinguishing feature of the various species in the Ypthima family is the typical yellow-ringed black ocelli and each species is identified by the total number of rings (eyespots) it has on the underside of its hindwings. Some of which are Ypthima huebneri (Common Four Ring), Ypthima pandocus corticaria (Common Three Ring) and Ypthima fasciata torone identified with having 6 rings. 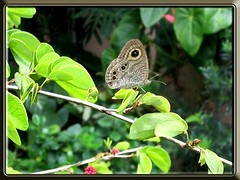 More lovely butterfly images and information can be found at Singapore Butterfly Checklist!